View permissions for viewing content in the Help Center knowledge base. View permissions include both internal and external users. Management permissions for creating, editing, and publishing content in the Help Center knowledge base. Management permissions include internal users only. User permissions are defined by user segments. You apply user segments to articles to define user viewing permissions. You use user segments to build management permissions, which you then apply to articles to define agent editing and publishing permissions. User segments are the building block of user permissions. A user segment is a group of agents and/or end-users defined by a specific set of attributes. 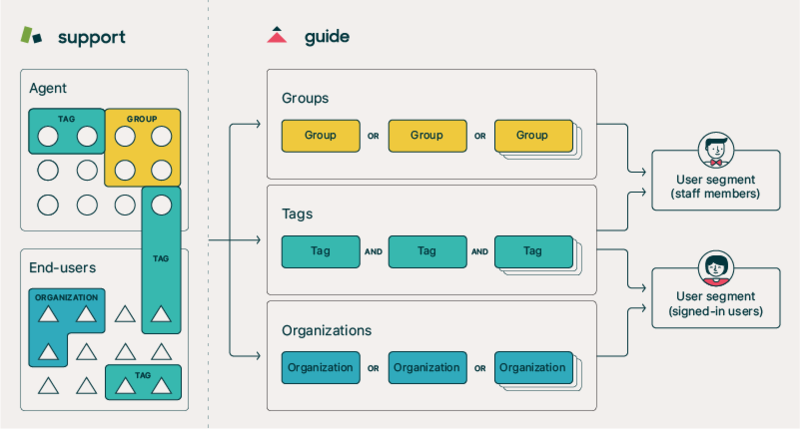 Before you build or set your user permissions, you'll want to make sure you have created the necessary users segments to define your user groupings. To create users segments, see Creating user segments. User permissions include content view permissions and management permissions. You do not need to build view permissions--you apply a user segment directly to an article to set the view permissions for that article--so you can skip this step for view permissions. You do need to build management permissions to define editing and publishing rights for agents, then apply it to an article to set agent management permissions for that article. Managers is active by default and gives only Guide Managers edit and publish permission. 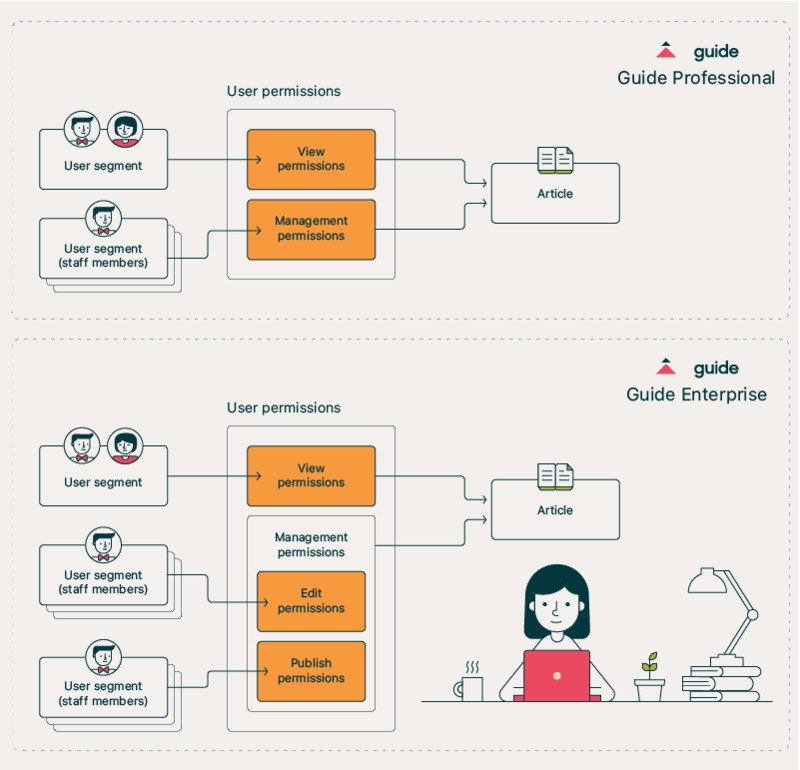 Editors and publishers (Enterprise only) can be activated on Enterprise and gives all agents and managers edit permission, but gives only Guide Managers publish permission. You can create management permissions based on user segments. On Professional, edit and publish permissions are assigned together, to a user segment of agents. On Enterprise, editing and publishing permissions are separate, so that they can be assigned to different user segments. To create management permissions, see Creating management permissions to define agent editing and publishing rights. You apply user permissions at the article level. You cannot apply permissions to a category or section. View permissions You apply a user segment to an article to set the view permissions for that article. To apply view permissions, see Setting view permissions on articles with user segments. Management permissions You apply management permissions to define editing and publishing rights for agents, then apply it to an article to set agent management permissions for that article. To apply management permissions, see Setting agent editing and publishing permissions on knowledge base articles. I am unable to remove User Segments from a User, I am also prevented from deleting a user segment even though there are no articles/users associated with the Segment. I see you have reached out to us directly, and an agent is working with you on resolving this. We look forward to your response on that request! But how I can set permission for a section? I want to hide some section from all users and I want these section to be visible only by partners. If you want to set permissions for all articles in a section, you can do it using bulk actions. First create an article list, filtered by the section you want to restrict. Then select all the articles in the list and bulk update the permissions. I have two sections, one with generally available articles, and a second with articles restricted to a certain group of users. I create a user segment for the chosen group. I create an article in the second section, and set it as Visible to the chosen group segment. Does this then mean that from the main landing page the second section is not visible to users who are not part of the chosen group? The goal is to redirect all users to a landing page, and if they are in the chosen group, they see additional information. So if you have all articles within a Section available to only users within a chosen user segment, that section will be completely hidden fro users outside that user segment. Same goes for Categories. If all Sections within a Category are hidden due to all articles within those Sections being visible to specific users, then the Category itself will be hidden from any users outside that segment. There's no option to limit visibility at the section level. This is limited to the article editing page. However, if all articles within a section are restricted to only signed-in users then that section will only be visible to signed-in users. If all articles within the section are restricted to only agents and managers then the section will also only be visible to agents and managers. I hope the above make sense!